Jewish Nevada and the Israeli-American Council (IAC) are very excited to partner this Summer to offer THREE different Birthright Israel trips – for THREE different age groups! We are now actively seeking candidates to be part of this extraordinary experience! This year, we are thrilled to offer a one of a kind trip, exclusively for young professionals — if you are between the ages of 27-32, this is your chance to experience Birthright like never before! Taglit is much more than just a free trip… It is a life changing experience. Registration is now OPEN — Share the gift with someone else by sending them this email, or reach out to us with any questions you may have. 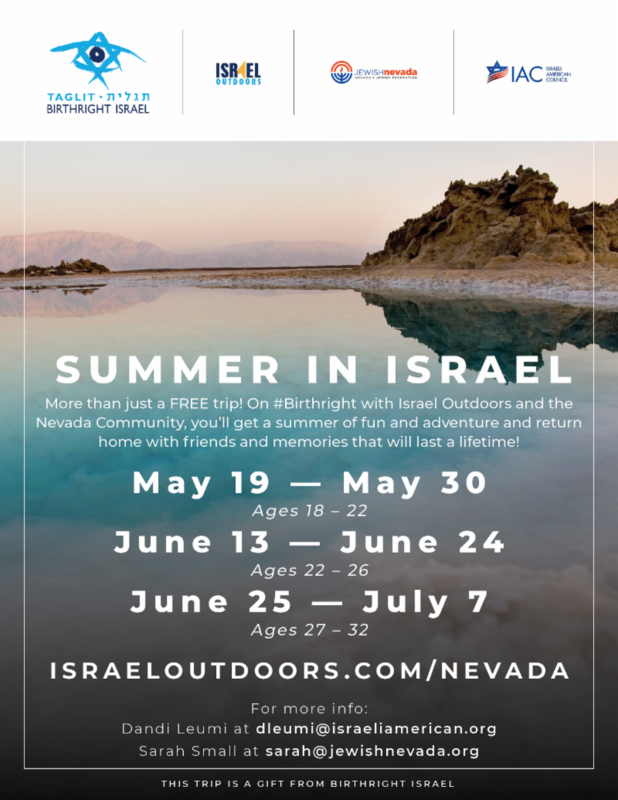 For questions and more information on Nevada campus + community Birthright Israel trips, please email dleumi@israeliamerican.org or sarah@jewishnevada.org.